I don't play to much, but some days ago I've found an interesting game. If you are a true believer in God, this post might offend you and you might consider it a sin. I don't created the game, I played and enjoyed it, and I don't feel like I've committed a sin. 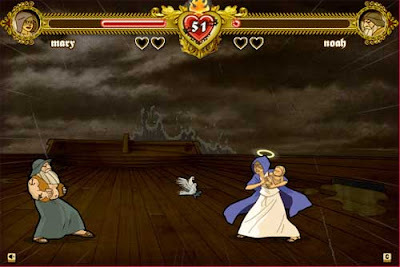 In a few words this game is just like the old Street Fighter or Mortal Kombat but the characters are from bible : Eve, Noah, Moses, Mary, Satan and Jesus, and the final boss is GOD. Here you have a few screen shoots of the game, that I've made when I played this game. I know is a crazy idea, but is fun. 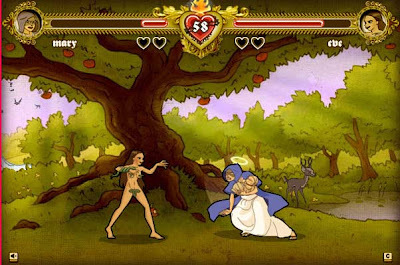 You can play the game ( "Bible Fight" ) here. eve looks pretty hot...is that a sin? What? Cause she's naked? Meat axe.